If you've ever had your sewer line cleaned by a professional, you know how much it costs. 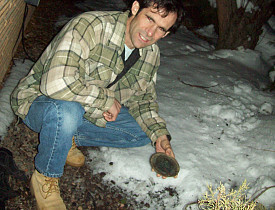 One well known sewer maintenance business in the Denver area starts their pricing at $250 for a routine clog clearing. If your cleanout isn't conveniently located, that'll be extra. If the job takes more than an hour, that'll be extra, too. You get the idea. Granted, this isn't a task most people would relish, and many folks would gladly pay any amount to have someone else do it. But for a plucky DIYer who's not afraid to get a little doo-doo sludge on their clothes, renting a sewer auger and clearing their own drain is definitely doable (or, I should say, doo-doable). Note: This article does not apply to houses with septic systems. Just to be clear about what we're discussing here, a home sewer line is the big drain pipe (typically 4-inch) that runs from the bottom of main waste/vent stack (main drain) in the house, down under the yard, and into the city sewer main under the street. The city takes care of the sewer main only. Everything else is your responsibility, from the house all the way to, and including, the tap that joins your line to the city main. You auger the drain via a cleanout—an access hole in the sewer line intended just for this purpose. Your cleanout may be a threaded plug at the end of a fitting or short length of pipe attached to the main drain (typically found in the basement or crawlspace). It could also be outdoors, evidenced by a plug or small manhole-like cover sealing the top of steeply sloping pipe that leads down through the ground and into the sewer drain pipe. Old houses may not have a cleanout, in which case the sewer line is typically accessed by removing a toilet in the house, because its drain is the only one large enough for the auger. If this is your situation, call a professional plumber (pulling the toilet is an extra, of course). Sewer augers, or sewer snakes, are commonly available at tool rental outlets. This power tool consists of a 100-foot (or sometimes 50-foot) cable wrapped inside of a metal cage-like spool, which is turned by a reversible electric motor. The auger frame has two wheels, so you tip it back and roll it around like a moving dolly. At the business end of the cable is a curved, two-pronged cutter head that rotates along with the cable to cut through the clog. and a wrench or screwdriver for the cleanout. I also like to have a garden hose for flushing and testing the drain before returning the auger. Now comes the fun part. The first step is to remove the cleanout plug or cover. However, if your drain is backed up well into the house, opening the cleanout can release a tsunami of sewage as the 4-inch drain pipe empties itself onto your basement floor. You have to wait until the drain is empty above the cleanout before removing it. If the clog is so bad that there's no drainage, you might want to contact a pro, or figure out how to capture the contents in a relatively clean and hygienic manner (good luck). Position the auger a few feet away from the cleanout and plug its power cord into a nearby electrical outlet. Most augers have a foot pedal for operating the motor hands-free; set this down in a convenient location. Pull out the cable and feed it into the pipe a few feet, then press the pedal to start spinning the cable (and cutter head) in the normal (clockwise) rotation. While the auger is spinning, pull the cable off of the spool and feed it into the drain a foot or so at a time. In addition to powering the cutting action, the rotation helps the cable work its way through bends in the drain pipe. If the cable meets resistance, it could be a bend or a clog. In either case, don't force it. Back off the cutter head by retracting the cable a bit, then feed it in again. When the cutter encounters an obstruction (typically a bad clog or tree roots), it may grab the material and stop—while the cable keeps spinning. The cable is actually a tightly wound torsion spring, so you can let it wind up for a few rotations, but going too far can break it. Let the pressure build up a little bit, then yank the cable back to pull the cutter free; the cable will instantly spin back to its resting position. If the cutter gets stuck and you can't get the cable unwound, stop the auger rotation, hit the reverse switch on the motor, and rotate the auger backward, then pull the cutter free before resuming in the clockwise rotation. Once the cable is back to normal, start feeding it in again. Repeat the process until you clear the clog. Often it's necessary to pull the cable all the way back out, running it through a rag and coiling it back into its spool cage as you go, to check the cutter head for roots and other detritus. Keep the motor off when pulling in the cable, unless you need to reverse it a bit to get past a bend. If the drain is fairly full of water (and other stuff) you'll likely hear, or perhaps just sense, an extremely satisfying whoosh! when you get through the clog. Or your signal of success might be more subtle. In any case, repeat the snaking process a couple more times to make sure you got everything. You can run a garden hose down the pipe while doing the follow-up snaking, which helps clean the cable and may help flush out some debris. Leaving the hose on for a while after you're all done is a good way to confirm the clog is clear. Sometimes you just can't clear a clog. Could be a damaged pipe or a really big root (or a big tangle of small roots) or any other stubborn obstruction. A lot of clogs simply require the expertise and high-end equipment of a plumber or drain specialist. Again, don't work the auger too hard or spend hours on a point of blockage, because you'll probably end up damaging the auger or possibly the piping, and you won't clear the drain anyway. Don't feel bad; at least you tried. If you have to call in a pro, choose carefully. Drain work can get very expensive, especially if repairs are required, and prices vary widely. Best to go with a plumber you trust or a drain specialist with fair pricing and a sterling reputation. If a pro can't clear the clog, the next step is to have the drain videoscoped to see what the problem is and/or to pinpoint the location of the blockage. Philip Schmidt writes for Networx.